If you have received an email or a file which has been encrypted using ESET Endpoint Encryption (EEE) and a password was used to encrypt it, the email or file can be decrypted using the ESET Endpoint Encryption Reader. The EEE Reader utility is available for Windows or Mac platforms and allows decryption of files or text that has been encrypted using a password. This allows data to be sent securely to users who are not using EEE. To decrypt encrypted text, you will need to run the Reader by double clicking the Reader icon after downloading it. Once the Reader opens, you will need to highlight the encrypted text from the first '-' to the last '-' (as shown below) and copy it. 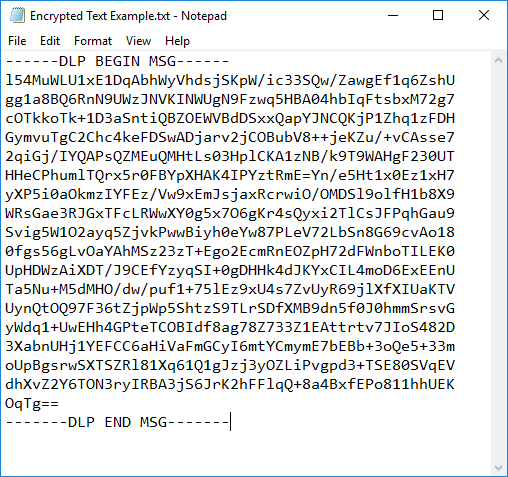 Now go to the Reader and paste the encrypted text into the window. After pasting the encrypted text, click the Decrypt button. At this point you will be prompted for the password which was set at the point of encryption, which should have been divulged to you by the person that sent you the email. Type the password and click OK. The decrypted text will then be displayed in the reader window and can be copied and pasted for your records. To decrypt an attachment sent via an email, you will need to first save the encrypted attachment from the email to somewhere on your machine. The desktop is a sufficient location for this purpose. Once the encrypted attachment is on the desktop, simply drag it into the Reader window and you will be prompted to input the password. Upon typing the password used to encrypt the attachment (this is usually the same password used to encrypt the text), the attachment will be decrypted and placed on the desktop. Please refer to this article KB516 - Why cant I decrypt messages in Reader?